Good quality with affordable price. Used for persnal care in caring role. Gloves don't break and non-vinyl, powder free causes no skin irritation. The gloves are used for personal care and cleaning. They are not the cheapest, but they are the cheapest that donesn't attract compalints about them breaking. I give respite in my own home so these are my personal choice. Any healthcare professionals would find these gloves of a good standard and great quality. Exactly what I need for food prep and general domestic use. These gloves are used mainly when applying steroid cream for eczema. However, they have various other uses too. Great value products for all sorts of people.my wife uses the vinyl gloves because of very sensitive skin and they are perfect for her. Good quality product used by care staff for PEG feeding. The gloves are used for personal care. II have received no complaints from the users. These are good gloves for people doing personal care. The gloves are personalprotective equipment for a range of personal care and maintenance tasks. Gloves delivered on time in perfect condition and in budget. 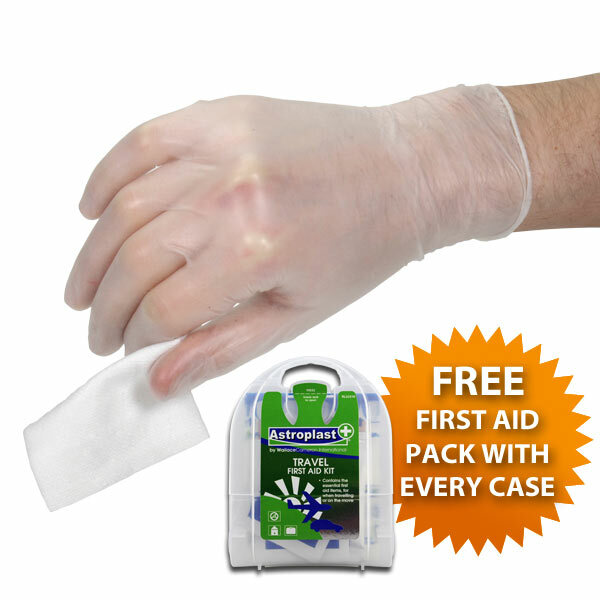 2 small first aid kits were added at no extra charge. This all makes it a great company to do business with. These gloves are exactly what we need. good product, used in caring. Good price too. Much in demand and arrived very quickly! I have repeated the order several times and find the quality and price excellent. Great value - and anti-allergenic. Product is used for giving PEG feeds to a disabled person living in own home. We find this a good quality product. It is easy to order, postage free and very swift delivery plus a good price which makes it ideal. For a standard vinyl glove, & for how cheap it is, the product is amazingly good! The glove can tear if pulled on too harshly, but otherwise it does the job nicely! I use them for personal care uses. I use the gloves while decorating and find the gloves very good value in both price and quality. The gloves are suitable,quickly delivered and inexpensive. It's good to get free delivery on larger orders. When they are the correct size they are good. I use the product for personal care for my father. The gloves can be used for many other things also. They are of good quality and great value for money.